Dug through my box of recipes as I knew I had a good one (well, sounded good on paper) for chicken and rice soup. Found it! In a large, heavy-bottomed pot add 2 tbsp olive oil and warm over medium heat. Add garlic, carrots (and celery and green onion if using) and saute for about 5 minutes. 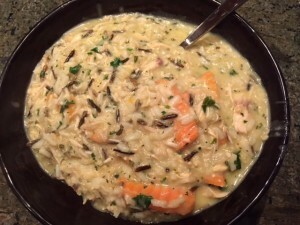 Add 6 cups of chicken stock, uncooked wild rice, cooked white rice, chicken and herbs and simmer for at least 20-30 minutes. In a small bowl mix the flour in the 1 cup of chicken broth making sure the flour is thoroughly blended with no lumps. Slowly add the flour/broth mixture to the soup. Simmer until soup thickens (about 15 mins or so.) If it does not thicken enough, take a little broth out of the pot and mix in another tbsp of flour and slowly add back to soup. Keep simmering until soup reaches desired consistency. Add the heavy cream and vermouth. Season with salt (I used Himalayan pink salt because duh…pink!) and pepper and add minced parsley. Simmer 10 minutes and serve!! p.s. I tasted the Vermouth….GAH! Don’t think I could channel Robin channeling Mork channeling Julia with that…. @a99kitten could you sub vermouth for some wine wine?